During a quiet few hours I have just created a new website for a club I am just starting. Before leaving on my trip I always felt that Bristol didn't have a group for ABRs and Trail riders. It has a TRF group but for me that never really worked as a networking thing. The Idea is a to be a social group who get together every now and then, Venue and times to be announced. The idea is not to have a formal meeting type thing with out an agenda just a place where we can all get to know each other and plan rides locally and further a field. 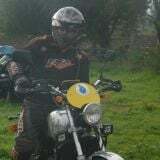 The club is based in bristol and our rides and meetings will be in the area, however membership is open to all. If you wish to join and be kept informed of our goings on please join at www.bristolatbc.co.uk, Emails will be kept to a minimum just once every now and then to update you of things that are going on.